I found this article in Bildjournalen from August the 10th 1966, and translated it. Now they are visible too. Why should shiny plastic clothes be something for girls only! That's what the Hollies thought, and were thrilled about the clothes we had brought. Alan refused to let go of his black plastic lumber jacket, and immediately wore it on stage, though the others haven't yet dared to take off their suits. 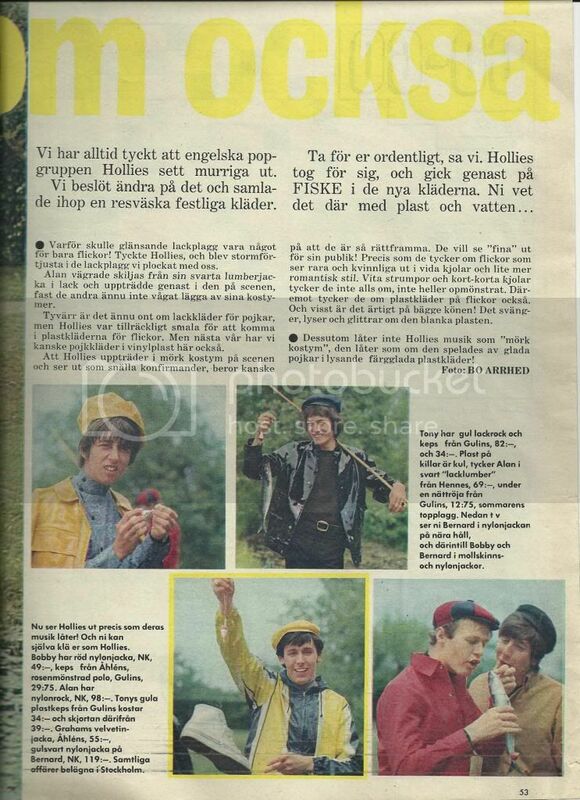 Unfortunately, there's still a lack of plastic clothes for boys, but the Hollies were slim enough to be able to wear the plastic clothes for girls. But next spring we might have boys' clothes in vinyl plastic here too. The fact that the Hollies appear in dark suits on stage and look like good school boys, is perhaps because they are so staightforward. They want to look "nice" for their audience! Just like the fact that they like girls to be sweet and feminine in wide skirts and a little more romantic style. White socks and mini skirts, they don't like at all, and not the op-pattern either. On the other hand, they like plastic clothes on girls too. And it sure looks snappy on both sexes! The glossy plastic swings, shines and glistens. 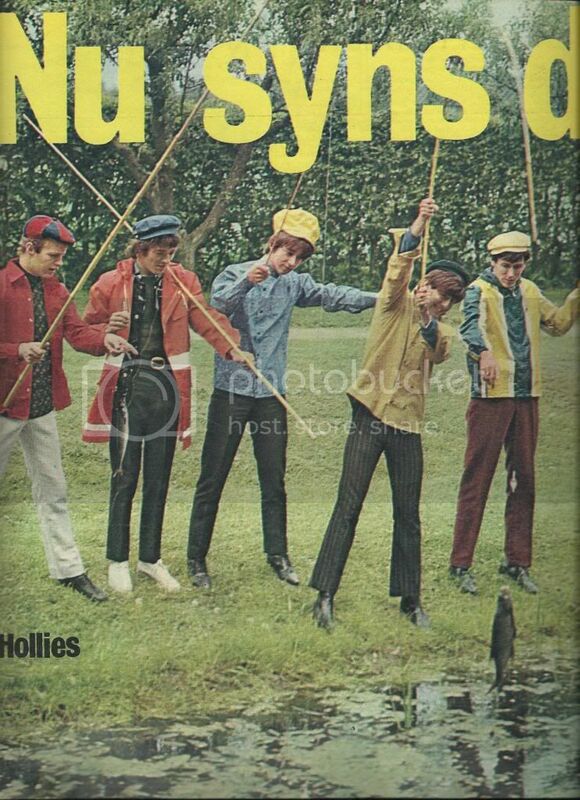 And besides, the Hollies' music doesn't sound like "dark suit", it sounds like it is played by happy boys in shining colourful plastic clothes! Here is a photo of Bernie from the same photo shoot. Thankyou Agnetha for the lovely photos and the translation. Now all of us people who only read English knows what the article says. 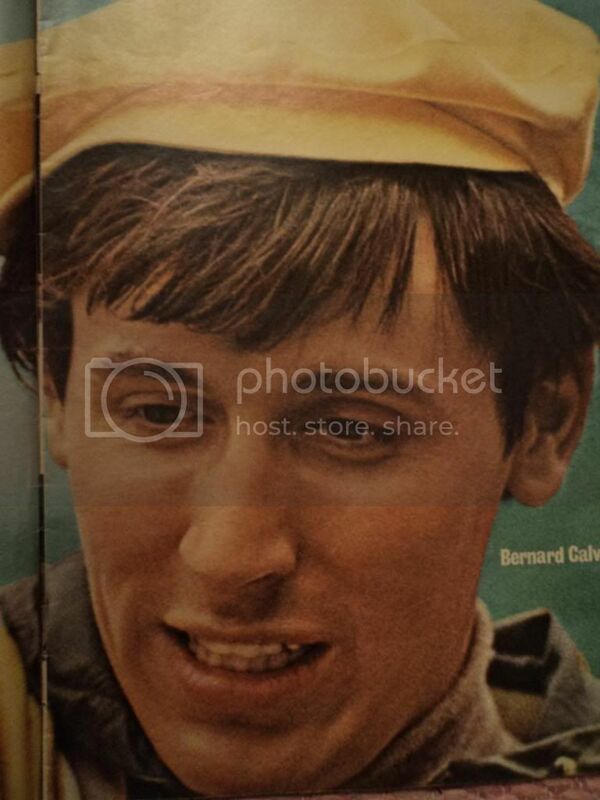 I especially love the big photo of my all-time favourite Hollie Bernie, he was so cute back in the 60's and 70's.